Former Matuguinao mayor Aran Boller sees politics as the motive on the slay trya to his life, dismissing claim of the NPA that they were responsible on the incident. CATBALOGAN CITY-Former mayor Aran Boller of Matuguinao, Samar dismissed claim by the New People’s Army that they were behind on attempt to his life. On November 18, while inside his vehicle parked in Barangay San Francisco, which is located within the district area of this city, Boller was fired upon by one of the three suspects, hitting him on his right hand. The city police of Catbalogan recovered eight empty shells from caliber 45 at the crime of the scene. The NPA’s Arnulfo Ortiz Command (AOC), in a statement, said that they were responsible on Boller’s slay try as he was said to be responsible in “series of unsolved killings and other acts of reactionary violence” in the town. “The special operations group of the AOC attempted to carry out the decision of the people’s court to impose the death penalty on Aran Boller, ex-mayor of Matuguinao, who managed to escape justice. Boller was found guilty as the criminal mastermind behind the series of unsolved killings and other acts of reactionary violence in the town,” the outlawed group, which operates in Samar, said in a statement. But Boller, who is running for mayor in next year’s elections against incumbent Vice Mayor Carmel de la Cruz, maintained that there would be no other group who are interested to kill him but his political opponents. “I really doubt if they were really behind on the incident. I don’t see any reason why they will do that. The only reason that I see why this happened is politics,” the mayoralty candidate said. Boller became the vice mayor of the town after then mayor, Celso de la Cruz, was gunned down in 2009. The incumbent mayor, Melissa de la Cruz, daughter of the slain mayor, is now on her third and last term with her sister, incumbent Vice Mayor Carmel de la Cruz, switching posts for the 2019 elections. “I am running on the basis of their trust on me. I could win the election because the people want change. 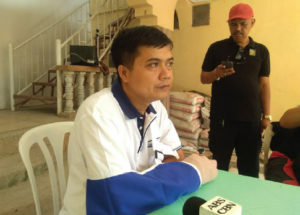 They have been suffering extreme poverty because of the neglect of the current administration in Matuguinao,” he said. Boller said that after the incident, he even thought of withdrawing from running but was prevailed upon by his supporters.